Sophie qualified as a physiotherapist in 2012, from the University of Nottingham. She has worked in private practice ever since and has worked with sports teams alongside that. She enjoys working as a physio because of the variety that the job offers, the opportunity to work with lots of different people with different problems, and the challenge of creating a bespoke treatment plan for every patient. She values working with a team of professionals to ensure that her patients can access other services when needed and good communication between her and her colleagues will provide a well integrated and well managed rehabilitation plan for those patients. 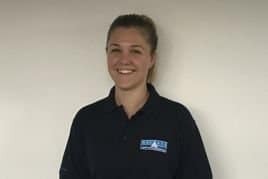 Sophie uses her manual therapy skills and knowledge of movement and sport to help patients access their full potential either after an acute injury or whilst managing a chronic condition. She pulls on her experience in working with rugby teams, athletes, dancers, rowers and gym goers! She has also 3 years experience working with adolescent athletes. Sport and being active has always been a key feature in Sophie’s life. Initially rugby, Karate and gymnastics, then squash, athletics and hockey to an international standard throughout her teenage years. Currently she is focusing on yoga, strength training, and running. Sophie believes that good awareness of ones body and movement patterns/habits is key to achieving optimum physical health and is directly linked to ones mental health in many ways. Sophie finds that helping patients understand their problem and engage them in planning a way to manage it, has significant benefits, both in the short term and long term.